After fifteen years in the cold, the International Monetary Fund (IMF) returned to Argentina this May. President Mauricio Macri promised to attract foreign direct investment and to make his country the ‘supermarket of the world’. Instead, Argentina’s economy went into a tailspin. The IMF entered with its shop-worn prescriptions, a recipe that it has effectively sold for the past four decades: structural adjustment. We will promise to give you funding and to help you attract investment, the IMF says, if you cut back on State spending on social infrastructure (education and health) and increase measures that are attractive to monopoly capitalism. Target inflation, say the IMF economists, not joblessness and desolation. The effect of these policies has been increased social inequality across the planet. The Credit Suisse Global Wealth Database and the UBS Wealth Report are chilling. UBS shows that the world’s ‘ultra-high net worth individuals’–those who hold more than US$30 million–are 0.004% of the world’s population but they control 12.8% of global wealth. Credit Suisse shows that in the past two decades, the top 1% of global wealth holders have increased their share of household wealth from 45.5% to 50.1%. You don’t need a Thomas Piketty to tell you what is evident around the world. These numbers carry within them policies–what makes this inequality happen–and feelings–how this terrible situation has to be lived by ordinary people. The IMF has made a career of making political interventions look like economic policy. To slash social spending and to guarantee a rate of return to banks is not science. It is class warfare. The very prescription written by the IMF to solve Argentina’s social and economic problem will precipitate further crises. Neoliberal policies do not seek to solve crises, but they seek to create a situation of permanent crisis. That is the basic argument of our Tricontinental: Institute for Social Research Dossier no. 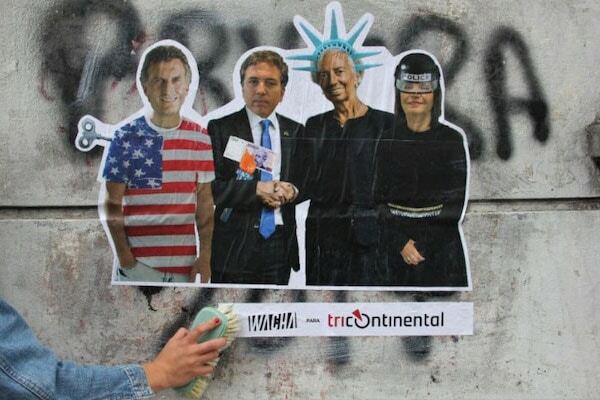 10: Argentina Goes Back to the IMF. You can download this dossier, written by our office in Buenos Aires, free from here (for a short summary of the dossier, written by our researcher Nate Singham, go here, and watch the little video on the dossier above). The dossier contains superb photographs by Barbara Leiva and Tristán Basile, as well as original art by Wacha (see above). A small window opens from the suffocation of Macri and the IMF. In Villa 21-24 in Buenos Aires–a working-class community–a left-leaning alliance Tierra, Techo y Trabajo (Land, Shelter and Work) has won the presidency of the neighbourhood council. This will boost the confidence of the left. It needs every sliver of hope. In Mexico, on 1 December, the left-leaning president–Andrés Manuel López Obrador–will take power. Already the IMF has interrupted his presidency before it began to say that he must make the imperialism of high finance happy rather than Mexico’s citizens (as I argue in my column this week). When López Obrador cancelled an expensive airport and then when the legislators from his party tried to move a law to limit bank fees, the stock market and foreign investors went on strike. The ratings agency Fitch downgraded Mexico to ‘negative’. This was a warning. López Obrador had to behave or else. The narrow framework for policy has been set by the IMF and by international banks. They do not care for Mexico’s social development. The test is Mexico’s oil industry. López Obrador knows that Mexico imports oil because its capacity to refine its own oil is insufficient. An IMF team left Mexico City with a rebuke. No investment should be made. Mexico must remain structurally dependent on monopoly oil firms and it must remain entangled with the United States. Any move to create sovereignty will be hit hard by the ratings agencies, the IMF and the banks. López Obrador is trapped. In our Notebook–Alternatives to Globalisation–Samir Amin considers how to build an alternative policy framework that breaks with the IMF consensus and that allows the majority of the people of the world to both shape policies and benefit from them. Amin’s view encourages us to imagine a different world. In this world, López Obrador does not worry about the IMF Article IV staff statement. He looks into the eyes of the hungry and desolate population of his country. He listens to their demands and their innovations. He turns to his Secretariat of Finance and Public Credit and to his Secretariat of Agrarian, Land and Urban Developments. He asks them to shape these demands and these ideas into their policies. Imagine that. When Mexico’s peso collapsed in 1994, the Zapatistas appeared in the forests of Chiapas. Subcomandante Marcos of the Zapatistas said that the solutions to currency crises and broader economic crises will not negatively impact the oligarchy or imperialism. The solutions by the government will hurt Mexico’s forgotten pockets (bolsillos de olvido). It is from these pockets that the caravan of migrants has been moving across Central America and Mexico towards the United States. Reuters’ Andrew Hay and Lucy Nicholson have a fantastic story–Deadly Crossing–about the journey of Joselino Gomez Esteban and Misael Paiz from Guatemala towards the U.S.-Mexico border. Paiz died on the journey. 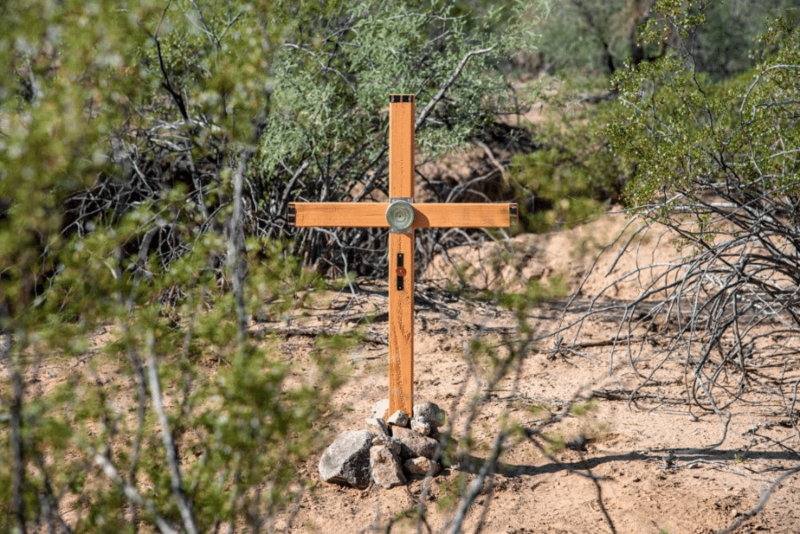 The Colombian artist Alvaro Enciso has begun to plant crosses–see above–where migrants die. Support all attempts to implement the right to health. Demand that governments and international organisations reformulate, implement and enforce policies and practices which respect the right to health. Build broad-based popular movements to pressure governments to incorporate health and human rights into national constitutions and legislation. Fight the exploitation of people’s health needs for purposes of profit. Exemplary here has been the government of Cuba and its medical missions around the world. The new President of Brazil Jair Bolsonaro attacked the 20,000 Cuban doctors, who have treated over 113 million people in the country–almost half of the population. These doctors came to Brazil as part of the Mais Medicos (More Doctors) programme set up in 2013 in collaboration with the government led by the Workers’ Party. Cuba will now–sadly–withdraw its doctors from Brazil. 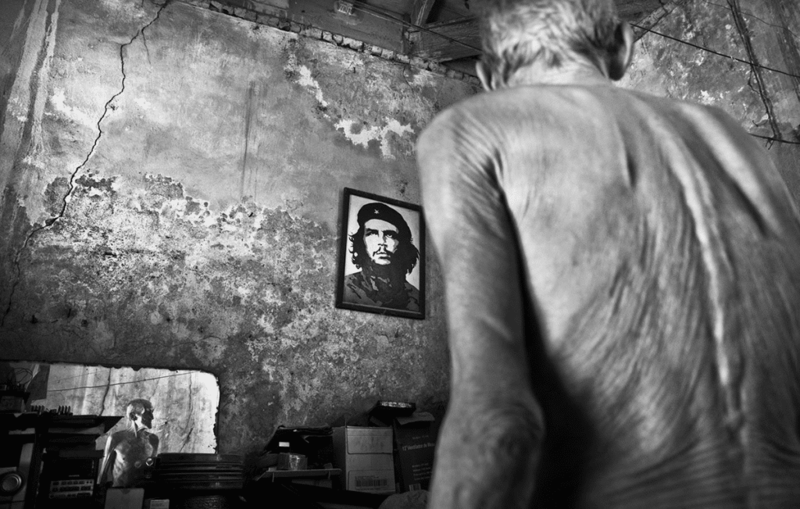 The picture above is by the Cuban photographer Eduardo García–a picture of Pablo Morales Perez, a member of the Communist Party, who lives in an old, crumbling building meant for the carriages of the oligarchy. The photographer has named this picture from 2011, Loyal to His Ideals. Bolsonaro has chosen Brazil’s new foreign minister–Ernesto Araujo. Araujo’s comical statements in favour of U.S. President Donald Trump and against climate change (blame it on the Marxists!) as well as his vision for Brazil to be part of a Christian and Western bloc should raise eyebrows. His appointment comes alongside Bolsonaro’s heated rhetoric against China (‘The Chinese are not buying in Brazil. They are buying Brazil itself’). But, Bolsonaro is trapped by the contradictions of Brazil’s economy and of its capitalist class. Brazil’s economy relies upon Chinese purchases of its raw material (including soy), but it also relies upon the U.S.-dominated banking system. It will be hard for Bolsonaro’s new minister of the economy–Paulo Guedes–to navigate the economic and political entanglements. Ideological purity will not be possible, since Brazil has already walked quite far into profitable arrangements with the BRICS (Brazil, Russia, India, China, South Africa) bloc. As it happens, Brazil will host the 11th BRICS summit next year. 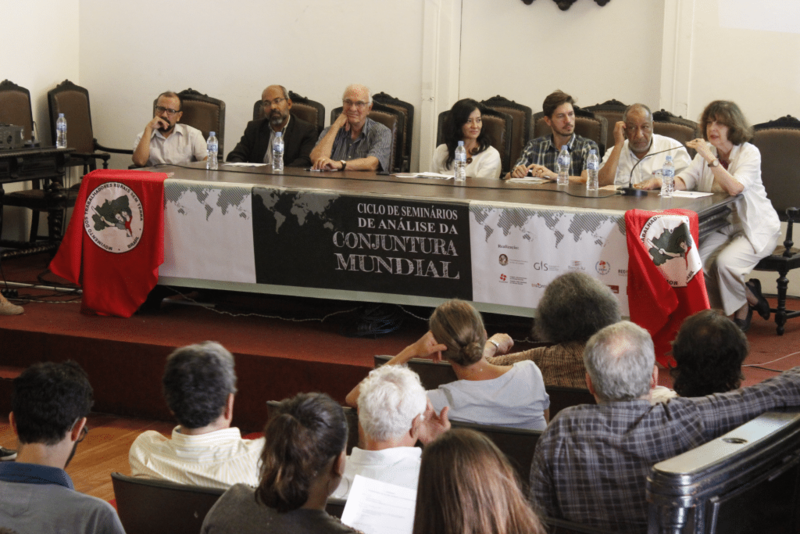 Our Tricontinental: Institute for Social Research office in Brazil co-hosted the first of ten seminars in Rio de Janeiro. Beatriz Bisso (UFRJ, Rio), Anna Esther Ceceña (UNAM, Mexico), Monica Bruckmann (UFRJ, Rio) and Samuel Pinheiro Guimarães (former Ambassador to Mercosul) confronted the new geo-political landscape–the crisis of capitalism and the emergence of neo-fascism as well as the shift in hegemony from the United States to China. These conversations–particularly on the shifting centre of gravity from Washington to Beijing–need to be tracked with care. About two hundred students and professors, trade unionists and militants from the various political movements attended the session. The title of this newsletter comes from a conversation held between the British artist and critic John Berger and the Brazilian photographer Sebastião Salgado. They are talking about Salgado’s book Migrations. Salgado talks about the people whom he photographs, ‘They are living their lives inside a tragedy the size of the planet’.Last week, the Haitian photographer Gérald Bloncourt (1926-2018) died. He, like Salgado, took photographs of people who live their lives inside the tragedy the size of the planet. 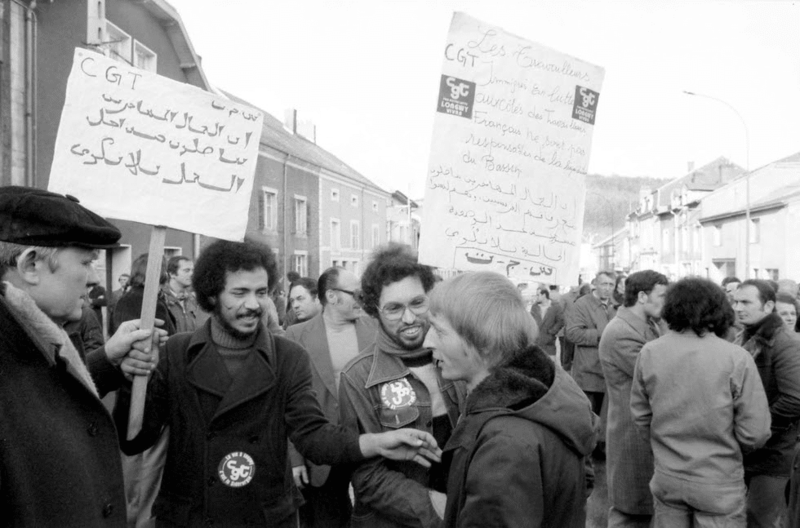 The picture above is from Longwy, France, when workers prepared for a trade union march in 1979. This was a period of great worker agitation across Europe. In this north-eastern corner of France, workers from North Africa carry signs in Arabic and French. Here is the scent of working-class unity. It was something that Bloncourt held close to his camera throughout his career (please see my obituary on his work, including a charming photograph he took in the USSR in 1963). Bloncourt was influenced by Soviet photographers, people such as Valentina Kulagina (1902-1987) and Varvara Stepanova (1894-1958), whom we celebrate below. 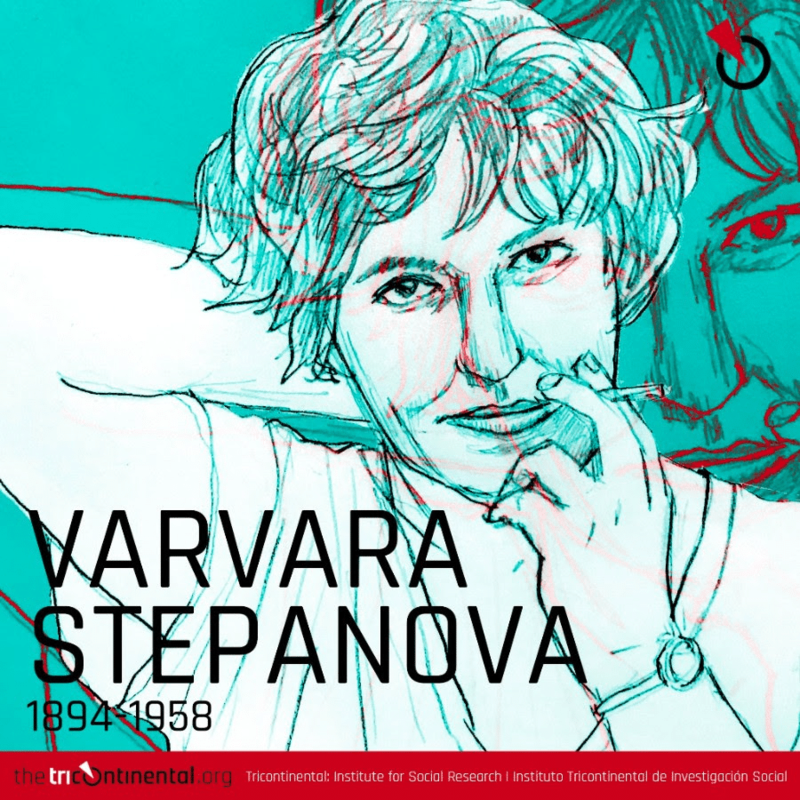 Varvara Stepanova was a painter, a photographer, a designer and a co-founder of the revolutionary art movement, known as Constructivism. There is some good news to end this newsletter. Our friend, the Bangladeshi photographer Shahidul Alam has been given bail (the government has appealed his bail). On the 100th day of his captivity, Arundhati Roy wrote a beautiful letter to him. Dear Shahidul, she writes, but then adds that there are so many sensitive militants imprisoned for their hope to produce a better world. ‘Dear Shahidul’, Arundhati writes, ‘I believe the tide will turn. It will. It must. This foolish, short-sighted cruelty will give way to something kinder and more visionary. This particular malaise, this bout of ill-health that has engulfed our planet, will pass’. PS: to read more of our dossiers and notebooks, working documents and newsletters, please do visit our website. For a quick introduction to our research agenda, go here.